Stir 1 serving, 30 g of powder (3 scoops) into 300 ml of water or skimmed milk (1.5% Fat) and drink preferably before or after a training. Advanced athletes: 50 g powder (5 scoops) in 250 ml of water. On days without training, drink in the morning or evening. The recommended minimum protein intake is 0.65 g per kg of body weight. It is suggested to consume 0.8-1 g per kg of body weight. The intake for physically active individuals may be even 1.2-2.5 g per kg of body weight, depending on their activity. Excessive consumption of whey protein may lead to stomach aches, cramps, smaller appetite, nausea and vertigo. It may also cause acne. Do not exceed the dosage recommended by the manufacturer. 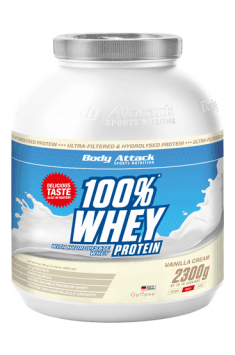 Consuming whey protein with some antibiotics may decrease their absorption. Supplement containing in its composition HMB. Increases secretion of IGF-1 and reduced the level of cholesterol. Superdrol boosts testosterone levels, increases muscle mass and strength. Powerful anabolic and anticatabolic formula. Acetylated form of L-carnitine. Supports the proper energy metabolism and displays nootropic effect. Saturated fatty acids are a group of fatty acid having different carbon chain lengths, in which except for the carboxyl group, each of the carbon atoms is linked by a single bond. Saturated fatty acids are commonly known as bad fat, which might adversely affect the cholesterol level, in particular by the action of acids: lauric, myristic, palmitic, and therefore their consumption should be reduced. Research carried out in this matter do not confirm entirely the prevailing beliefs. Dosage: No standards unit consumption. Excess of foods containing lactose is undesired.